The Temple Christian College Student Learning and Technology Hub celebrates the successful conversion of the iconic Heritage listed Thomas Hardy & Sons building into innovative learning spaces. Modern materials and furnishings have been intentionally designed to contrast with the heritage backdrop, and were selected to both complement and enhance the existing built form. This project provides the School community with versatile, innovative and multilayered learning spaces which invite creativity and exciting educational opportunities for years to come. 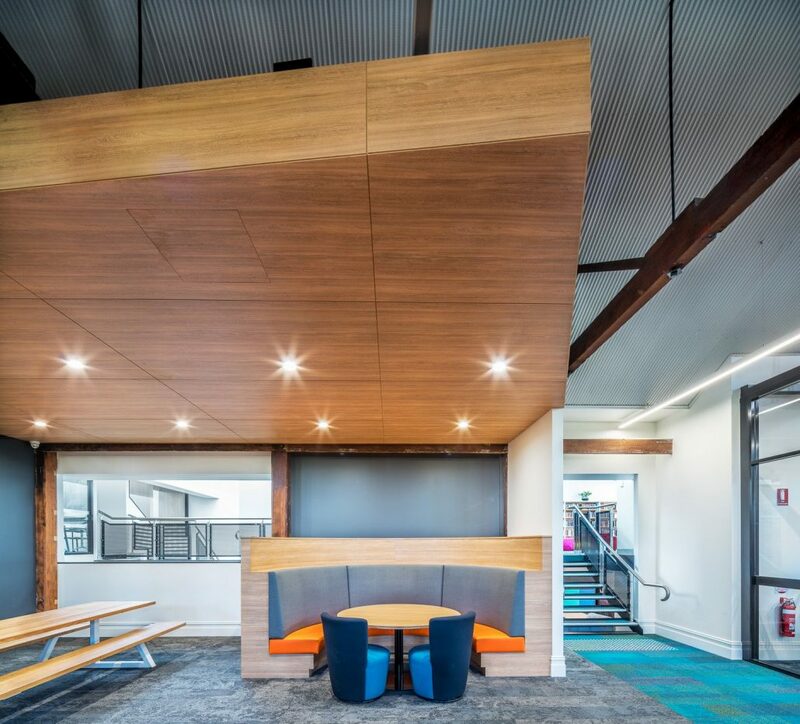 The Student Learning Hub was required to be a flexible space to accommodate numerous educational functions and learning environments. The Hub also incorporates a dedicated senior study with kitchen facilities, collaborative study areas and smaller break out zones. The layout for the Hub, which is designed across a number of levels successfully establishes visual connection between each space. The success of the Hub as a flexible and functional teaching environment is also accredited to the use of specialised furniture and joinery which has been selected or purpose-built, to enhance the spaces and functions of each area. Against the backdrop of the iconic stone heritage building, the delivery of these contemporary and flexible learning spaces has been both rewarding and inspiring for all parties. To see how the original concept evolved, please see our flythrough.